Dr. May is a board-certified hematologist and medical oncologist who has expertise in treating solid tumors, blood cancers and hematologic disorders. She completed training in internal medicine at Beaumont Hospital and was a fellow in hematology and oncology at the Emory University School of Medicine. 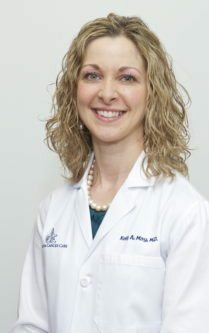 Dr. May is part of the Northside Hospital Lung Cancer Steering Committee, Quality & Therapeutics Committee, Lung Research Work Group, and she is the multidisciplinary breast conference facilitator. Dr. May serves as the Atlanta Cancer Care-Northside Hospital Cancer Institute’s Quality Program Co-Director. Dr. May has published research on breast cancer and supportive care.